Acupuncture is thought to restore health by removing energy imbalances and blockages in the body. Practitioners of TCM believe that there is a vital force or energy called qi (pronounced "chee") that flows through the body, and between the skin surface and the internal organs, along channels or pathways called meridians. There are 12 major and 8 minor meridians. Qi regulates the spiritual, emotional, mental, and physical harmony of the body by keeping the forces of yin and yang in balance. Yang is a principle of heat, activity, brightness, outwardness, while yin represents coldness, passivity, darkness, interiority, etc. TCM does not try to eliminate either yin or yang, but to keep them in harmonious balance. Acupuncture may be used to raise or lower the level of yin or yang in a specific part of the body in order to restore the energy balance. Acupuncture was virtually unknown in the United States prior to President Nixon's trip to China in 1972. A reporter for the New York Times named James Reston wrote a story for the newspaper about the doctors in Beijing who used acupuncture to relieve his pain following abdominal surgery. By 1993, Americans were making 12 million visits per year to acupuncturists, and spending $500 million annually on acupuncture treatments. By 1995, there were an estimated 10,000 certified acupuncturists practicing in the United States; as of 2000, there were 20,000. About a third of the credentialed acupuncturists in the United States as of 2002 are MDs. Acupuncture's record of success has been sufficiently impressive to stimulate a number of research projects investigating its mechanisms as well as its efficacy. Research has been funded not only by the National Center for Complementary and Alternative Medicine (NCCAM), but also by the National Institute on Alcohol Abuse and Alcoholism (NIAAA), the National Institute of Dental Research, the National Institute of Neurological Disorders and Stroke (NINDS), and the National Institute on Drug Abuse. In 1997 a consensus panel of the National Institutes of Health (NIH) presented a landmark report in which it described acupuncture as a sufficiently promising form of treatment to merit further study. In 2000, the British Medical Association (BMA) recommended that acupuncture should be made more readily available through the National Health Service (NHS), and that family doctors should be trained in some of its techniques. As already noted, the purpose of acupuncture in TCM is the rebalancing of opposing energy forces in different parts of the body. In Western terms, acupuncture is used most commonly as an adjunctive treatment for the relief of chronic or acute pain. In the United States, acupuncture is most widely used to treat pain associated with musculoskeletal disorders, but it has also been used in the treatment of substance abuse, and to relieve nausea and vomiting. A study done in 2001 showed that acupuncture was highly effective in stopping the intense vomiting associated with a condition in pregnant women known as hyperemesis gravidarum. In the past several years, acupuncture has been tried with a new patient population, namely children with chronic pain syndromes. One study of 30 young patients with disorders ranging from migraine headaches to endometriosis found that 70% felt that their symptoms had been relieved by acupuncture, and described themselves as "pleased" by the results of treatment. In addition to these disorders, acupuncture has been used in the United States to treat asthma, infertility, depression, anxiety, HIV infection, fibromyalgia, menstrual cramps, carpal tunnel syndrome, tennis elbow, pitcher's shoulder, chronic fatigue syndrome, and postoperative pain. It has even been used in veterinary medicine to treat chronic pain and prevent epileptic convulsions in animals. As of 2002, NCCAM is sponsoring research regarding the effectiveness of acupuncture in the rehabilitation of stroke patients. Western studies have found evidence that the traditional acupuncture points conduct electromagnetic signals. Stimulating the acupuncture points causes these signals to be relayed to the brain at a higher than normal rate. These signals in turn cause the brain to release pain-relieving chemicals known as endorphins, and immune system cells to weak or injured parts of the body. Other studies have shown that acupuncture activates the release of opioids into the central nervous system. Opioids are also analgesic, or pain-relieving compounds. The purpose of acupuncture is to rebalance opposing energy forces in different parts of the body. In the United States, acupuncture is most widely used to treat pain associated with musculoskeletal disorders, but it has also been used in the treatment of substance abuse, and to relieve nausea and vomiting. Acupuncture appears to alter the chemical balance of the brain itself by modifying the production and release of neurotransmitters and neurohormones. Acupuncture has been documented to affect certain involuntary body functions, including immune reactions, blood pressure, and body temperature. It lacks the side effects associated with many medications and surgical treatments in Western medicine. It is highly cost-effective; it may be used early in the course of a disease, potentially saving the patient the cost of hospitalizations, laboratory tests, and high-priced drugs. It can easily be combined with other forms of therapy, including psychotherapy. It carries relatively few risks. 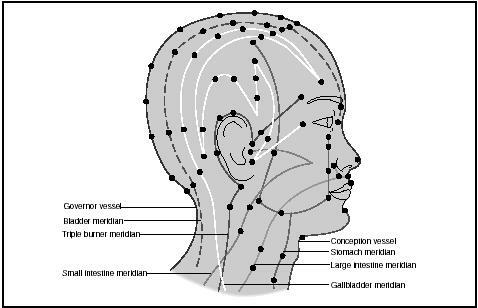 Acupuncture sites and meridians on the face and neck. Although the risk of infection in acupuncture is minimal, patients should make sure that the acupuncturist uses sterile disposable needles. In the United States, the Food and Drug Administration (FDA) mandates the use of sterilized needles made from nontoxic materials. The needles must be clearly labeled as having their use restricted to qualified practitioners. Patients should also inquire about the practitioner's credentials. Since acupuncture is now taught in over forty accredited medical schools and osteopathic colleges in the United States, patients who would prefer to be treated by an MD or an osteopath can obtain a list of licensed physicians who practice acupuncture in their area from the American Academy of Medical Acupuncture. With regard to nonphysician acupuncturists, 31 states have established training standards that acupuncturists must meet in order to be licensed in those states. In Great Britain, practitioners must qualify by passing a course offered by the British Acupuncture Accreditation Board. Patients seeking acupuncture treatment should provide the practitioner with the same information about their health conditions and other forms of treatment that they would give their primary care doctor. This information should include other alternative and complementary therapies, especially herbal remedies. Acupuncture should not be used to treat severe traumatic injuries and other emergency conditions requiring immediate surgery. In addition, it does not appear to be useful in smoking cessation programs. As is true with other forms of medical treatment, a minority of patients do not respond to acupuncture. The reasons for nonresponsiveness are not known at the present stage of research. Traditional Chinese medicine teachings state that channels of energy flow throughout the body, and that disease is caused by too much or too little flow of energy along these channels. 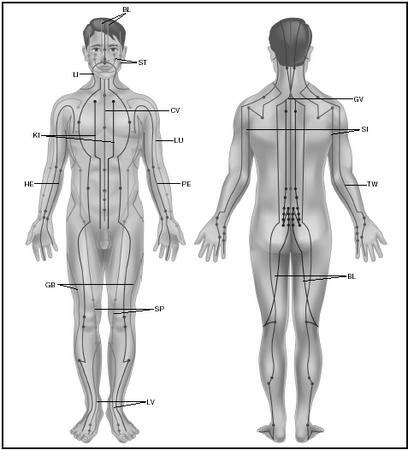 Points along the channels, called meridians, are manipulated in acupuncture. In the illustration, points are shown on the bladder (BL), conception vessel (CV), gall bladder (GB), governing vessel (GV), heart (HE), kidney (KI), large intestine (LI), liver (LV), lung (LU), pericardium (PE), small intestine (SI), spleen (SP), stomach (ST), and triple warmer (TW) meridians. points that should be stimulated to unblock the qi or restore harmony. Up to ten or twelve acupuncture needles will be inserted at strategic points along the relevant meridians. In traditional Chinese practice, the needles are twirled or rotated as they are inserted. Many patients feel nothing at all during this procedure, although others experience a prickling or mild aching sensation, and still others a feeling of warmth or heaviness. The practitioner may combine acupuncture with moxibustion to increase the effectiveness of the treatment. Moxibustion is a technique in which the acupuncturist lights a small piece of wormwood, called a moxa, above the acupuncture point above the skin. When the patient begins to feel the warmth from the burning herb, it is removed. Cupping is another technique that is a method of stimulation of acupuncture points by applying suction through a metal, wood, or glass jar, and in which a partial vacuum has been created. Producing blood congestion at the site, the site is thus stimulated. The method is used for lower back pain, sprains, soft tissue injuries, as well as relieving fluid from the lungs in chronic bronchitis. Electroacupuncture. In this form of acupuncture, the traditional acupuncture points are stimulated by an electronic device instead of a needle. Japanese meridian acupuncture. Japanese acupuncture uses thinner, smaller needles, and focuses on the meridians rather than on specific points along their course. Korean hand acupuncture. Traditional Korean medicine regards the hand as a "map" of the entire body, such that any part of the body can be treated by stimulating the corresponding point on the hand. Western medical acupuncture. 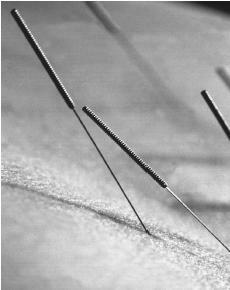 Western physicians trained in this style of acupuncture insert needles into so-called trigger points in sore muscles, as well as into the traditional points used in Chinese medicine. Ear acupuncture. This technique regards the ear as having acupuncture points that correspond to other parts of the body. Ear acupuncture is often used to treat substance abuse and chronic pain syndromes. A standard acupuncture treatment takes between 45 minutes to an hour and costs between $40 and $100, although initial appointments often cost more. Chronic conditions usually require 10 treatment sessions, but acute conditions or minor illnesses may require only one or two visits. Follow-up visits are often scheduled for patients with chronic pain. As of 2000, about 70%–80% of health insurers in the United States reimbursed patients for acupuncture treatments. Apart from a medical history and physical examination, no specific preparation is required for an acupuncture treatment. In addition to using sterile needles, licensed acupuncturists will wipe the skin over each acupuncture point with an antiseptic solution before inserting the needle. No particular aftercare is required, as the needles should not draw blood when properly inserted. Many patients experience a feeling of relaxation or even a pleasant drowsiness after the treatment. Some patients report feeling energized. Several American and British reports have concluded that the risks to the patient from an acupuncture treatment are minimal. Most complications from acupuncture fall into one of three categories: infections, most often from improperly sterilized needles; bruising or minor soft tissue injury; and injuries to muscle tissue. Serious side effects with sterilized needles are rare, although cases of pneumothorax and cardiac tamponade have been reported in the European literature. One American pediatrician estimates that the risk of serious injury from acupuncture performed by a licensed practitioner ranges between 1:10,000 and 1:100,000— or about the same degree of risk as a negative reaction to penicillin. Normal results from acupuncture are relief of pain and/or improvement of the condition being treated. Abnormal results from acupuncture include infection, a severe side effect, or worsening of the condition being treated. Pelletier, Kenneth R., MD. "Acupuncture: From the Yellow Emperor to Magnetic Resonance Imaging (MRI)." Chapter 5 in The Best Alternative Medicine. New York: Simon and Schuster, 2002. Reid, Daniel P. Chinese Herbal Medicine. Boston, MA: Shambhala, 1993. Svoboda, Robert, and Arnie Lade. Tao and Dharma: Chinese Medicine and Ayurveda. Twin Lakes, WI: Lotus Press, 1995. Cerrato, Paul L. "New Studies on Acupuncture and Emesis (Acupuncture for Relief of Nausea and Vomiting Caused by Chemotherapy)." Contemporary OB/GYN 46 (April, 2001): 749. Kemper, Kathi J., and others. "On Pins and Needles? Pediatric Pain: Patients' Experience with Acupuncture." Pediatrics 105 (April 2000): 620–633. Kirchgatterer, Andreas. "Cardiac Tamponade Following Acupuncture." Chest 117 (May 2000): 1510–1511. Nwabudike, Lawrence C., and Constantin Ionescu-Tirgoviste. "Acupuncture in the Treatment of Diabetic Peripheral Neuropathy." Diabetes 49 (May 2000): 628. Silvert, Mark. "Acupuncture Wins BMA Approval (British Medical Association)." British Medical Journal 321 (July 1, 2000): 637–639. Vickers, Andrew. "Acupuncture (ABC of Complementary Medicine)." British Medical Journal 319 (October 9, 1999): 704-708. American Academy of Medical Acupuncture/Medical Acupuncture Research Organization. 5820 Wilshire Boulevard, Suite 500, Los Angeles, CA 90036. (800) 521-2262 or (323) 937-5514. Fax: (323) 937-0959. <www.medicalacupuncture.org> . American Association of Oriental Medicine. 433 Front Street, Catasaqua, PA 18032. (610) 266-1433. Fax: (610) 264-2768. <www.aaom.org> . National Center for Complementary and Alternative Medicine (NCCAM). Fact Sheets. Acupuncture Information and Resources. <www.nccam.nih.gov/fcp/factsheets/ acupuncture> . As i saw in the website,kindly help as my son is suffering from in balance mind in his life,he cant keep steady mind always changing time to time,please tell me the treatment to cure my son problem,,he is 19years old,iam totally upset.kindly do the needful.